Removal boxes St Helens delivered free to your door. 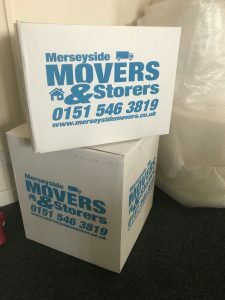 Are you looking for double walled, sturdy removal boxes in St Helens for your house move, if so call us on 0151 546 3819. As we are a removal company, we carry boxes of all shapes and sizes, bubble, wrap, mattress protectors, etc. Everything you need to wrap and protect your fragile belongings during your house move. We can provide you with a full removal pack for your size property with everything included, from our expertise we know how many removal boxes you should need and can deliver it all, including wardrobe cartons, book boxes, large boxes, bubble wrap, protective paper to wrap your fragile and mattress covers. Please call us on 0151 546 3819 to order your removal pack, delivered to your front door.